The around the world leader in creating one of the most innovative glass mosaic products is Bisazza. They provide an endless variety of imaginative solutions for your pool, as well as surroundings. Bisazza Swimming Pools are breathtaking with amazing tile work and gorgeous designs. Bisazza is a luxury style glass tile from Italy that combines precious metals like Gold with rich glass tones. Our Mosaic Sheets have an innovative support that exceeds adhesion standards for European pools. Readily available in a stunning selection of colours, including non-transparent and transparent surfaces. 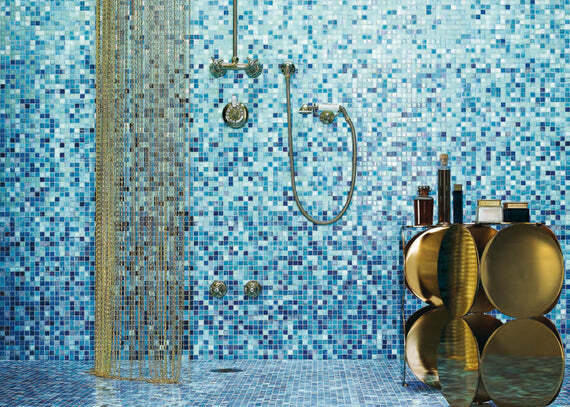 Bisazza mosaics produce great sparkling results in water. Bisazza swimming pool tiles combine advanced technology and traditional craftsmanship for stunning tile designs. This is the lap of luxury. Bisazza tiles are great for indoor and external applications as well such as bathroom tile and shower room tile as well as a decorative mosaic. Click here for more. Are you looking for something really unique for your swimming pool design? Perhaps a nice mosaic at the bottom? Bisazza swimming pools mosaics use our Bisazza tiles in a shape that can be used on the bottom or sides of the pool. These tiles are Engineered above the European Pool standards to allow the perfect adhesion. Bisazza swimming pools are pieces of art. The tiles are Engineered to the top level perfection using precious metals and combined with rich glass tones. Bisazza Swimming Pool tiles provide a beautiful and durable finish with easy installation. We always recommend purchasing the optional installation kits with all our Bisazza swimming pool tiles. Bisazza Glass ceramic tile includes tremendous appeal as well as attraction to swimming pools, and when installed appropriately. Most kinds of glass ceramic tile represent the most long-lasting of all swimming pool and health club surface areas. Bisazza Pool Glass tiles are Italian made glass mosaic tiles. Glass tiles are available in a variety of forms, colors, and surfaces, as well as could be utilized to accent any style of pool. Be it standard, modern-day, or natural with have a large selection of glass tiles. Take a look at the numerous ways glass ceramic tiles can be utilized in pool and health facility designs. Glass tile swimming pools are completely lined with tiny mosaic sized glass ceramic tiles instead of traditional plaster. It is long lasting and also resistant to corrosion as well as lasts longer compared to another type of plaster option. These are more expensive than plaster. But, these last much longer. Designers like mosaic tiles due to the fact that they are so versatile. In the modern layout globe, areas of personalized color mixes can make all-time low of a pool sparkle in a series of hues. Due to the capability of glass tile to enhance and also reflect light into the water, glass pools are unusually bright and also clear. For even more conventional pools, some contractors are recreating old Roman concepts as well as information like the swimming pools of Caesar. In either case, the charm of a glass ceramic tile swimming pool completely sunlight is unrivaled by other. We have all kinds of options for glass tiles. Do you know what your colours are for your project? Start there! We understand that it can get overwhelming with all the options. Go to your project and think of a design. Start with the colour selection. Do you like Gold or Silver? What other options are you looking at? This will get your selection and option choices down. It is easy to start narrowing down your choices. Having good choices is great as a retailer. However, it can become a little difficult as a buyer.